Keeping My Students Safe Isn’t Easy. I want to keep my students safe, I really do, but it really is impossible. When it comes to student and staff safety, there are so many things wrong with the way my school is built and run that I don’t know where to begin. Our principal reminded the staff again this week that only the front door should be used for entrance and exit, so let’s start there. It is unlocked. Anyone can walk up the three steps, open the door, and be in the building. Anyone. Delivery people, parents, job applicants, former students. Anyone. Why not a shooter? Up three more steps and our shooter is in the lobby facing our security desk. Most of the time we have an unarmed but uniformed school security officer sitting there. Sometimes it is just a school aide. Guard or aide, he or she is the first victim. sfAssuming someone hears those shots, the PA system will announce a lockdown. The speakers in the library aren’t so loud and if it is noisy (I don’t run one of those silent libraries) I may not hear the announcement. I usually have my door open and he library is the first room down the hallway you face while shooting the security guard. At the start of a lockdown every teacher is supposed to lock our door(s), then herd our students away from the door and keep them quiet. To lock our doors we have to go out into the hallway, put a key in and turn it so the door locks, then go inside and move away from the door to where the students are. That’s right, there is no way to lock any classroom door from the inside. Out in the hall, I will be the second person our shooter sees. It has been nice knowing you. To protect my students and myself, some people are suggesting I, and other school staffers, should be armed. I’d need to get trained, and there are bullets that break into tiny harmless pieces if they don’t hit their target. How the bullets know that the kid or adult I actually shoot in error while trying to shoot the shooter isn’t my target and should remain harmless is beyond me, but science and technology have come so far so fast I might have missed that development. The idea that teachers or administrators, aides or APs could shoot a shooter is a Rambo fantasy that pops up every time a school shooting occurs. There’s fantasy; then there’s the more likely reality. The shooter enters the building and pops Sgt. Perez. He’s lost some weight lately but he’s still a pretty big target. If I have a gun, I rush out of the library, take aim, and fire. I hit the garbage bin in the lobby, or maybe the nurse rushing out of her office. If two of us have guns, let’s say our most athletic assistant principal and I, we would shoot each other (accidentally, I’m sure) before we hit the rapidly moving shooter. Guns in school are not the answer. We’re not going to shoot our way to safety. None of us are Rambo. Lets start, instead, with keeping the front door locked, with everyone who wants to enter having to be checked via video before being allowed to enter. Let’s retrofit every door in the building so they can be locked from the inside. Will that keep us safe? Don’t Ban Guns, Regulate Them. I’m not anti-gun, though I don’t want to own one. I am against automatic weapons in private hands, fast-loading clips, and anti-NRA. I am in favor of mandatory waiting periods of at least 30 days between gun license application and delivery of gun, in favor of gun registration and mandatory annual inspections just like we have for cars, in favor of investigations of a gun applicant’s parents, children and siblings before a gun license is issued. Gun dealers must be required to have a license. 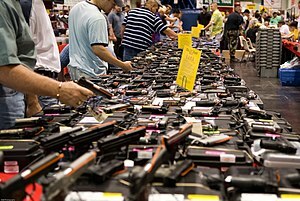 I am against gun sales at gun shows, interstate shipment of guns or ammunition, shipment of guns or ammunition by mail or other carrier to individuals – they should be required to be picked-up in person. I favor strict controls on the amount and type of ammunition individuals can buy, and am in favor of people who want to have guns having to pass a licensing exam and road test at least as rigorous as the requirements for driving. I also favor requiring gun owners to be personally and criminally liable for any use of their guns in a crime even if the guns are stolen from them (because it is their responsibility to make sure their guns are secure). I oppose carry permits for anyone unless they can prove a compelling need. I am against guns being carried within .25 miles of any school, public, private or parochial. I am also in favor of a complete rewrite of the 2nd amendment to clarify the meaning of a “well regulated militia” as the well-regulated part of it seems to be regularly ignored. Other than hat, enjoy your guns. I spent the summer of 1970 living in a house in Indianapolis that had no television, no books and no radio. It did have a phonograph, and three records: the Jackson 5’s newly released ABC album, an album of radical brothers Daniel and Philip Berrigan reciting poetry (“Wild strawberries are…………hard to find! ), and the Dave Brubeck Quartet’s Take Five. I got tired of listening to the Berrigans and the Jacksons pretty quickly — the last brother act that impressed me were the Marx boys — but I never got tired of listening to Brubeck, Paul Desmond, Joe Morello and Eugene Wright. Blue Rondo a la Turk, Take 5, Three to Get Ready, Strange Meadow Lark and the rest were the music of most of that summer until I finally bought a radio and discovered Edwin Starr’s War which became my theme song for a long time after. Indianapolis was a strange place. Down the block there was a house with a large anti-aircraft type weapon on the front lawn. Being the curious sort, I knocked on the door and asked about the big gun. Little did he know he was talking to the closest person to a Communist he was likely to run into. I was there to work on the Senate re-election campaign of Vance Hartke, the liberal Democrat not ashamed to be a liberal or a Democrat. We need many more men and women like him. There really is no point to this post. It is not about teaching, not about learning, not about anything except the memory of the man who opened my mind to jazz and life in a different rhythm. You are currently browsing the Education On The Plate blog archives for December, 2012.